The former Milwaukee Road Railway Post Office car, No. 2161, with its' six round porthole windows, had been in storage on the railroad since 2002. 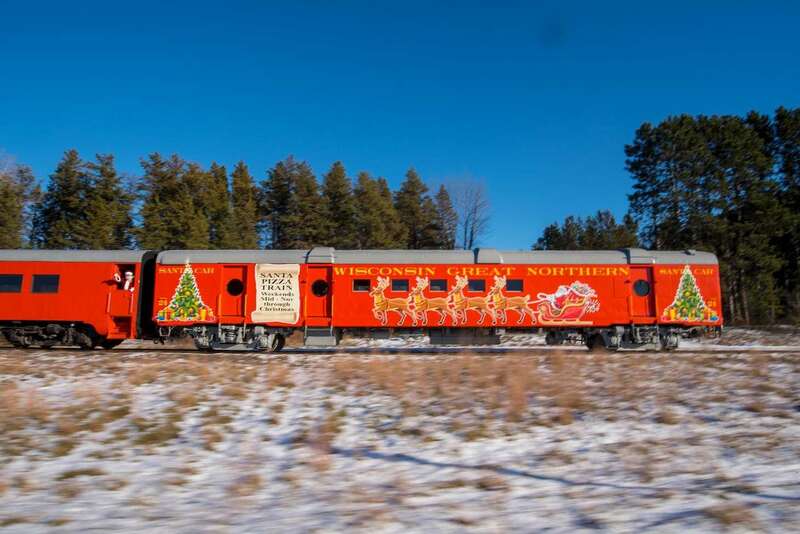 WASHBURN COUNTY -- The Wisconsin Great Northern Railroad in Trego, Wisconsin has recently completed the construction of what is believed to be the first dedicated Santa Car in the country. "This is the culmination of a dream we have had for over 10 years", said Greg Vreeland, General Manager. The former Milwaukee Road Railway Post Office car, No. 2161, with its' six round porthole windows, had been in storage on the railroad since 2002. In August 2018, work began on gutting the car down to the frame. The rusty exterior was repainted in the railroad's orange and gray scheme and has had festive seasonal graphics applied including Christmas trees and Santa's Sleigh with reindeer. The car is a show stopper and will serve as a rolling billboard advertising the family event. Wisconsin Great Northern Railroad Santa Car #24 brings up the rear of the popular Santa Pizza Train near the Namekagon River in Trego, WI. The inside has been redone in rich pine paneling and features two dozen decorated trees, wreaths, garland, and a real sleigh that guests can climb into for photographs. 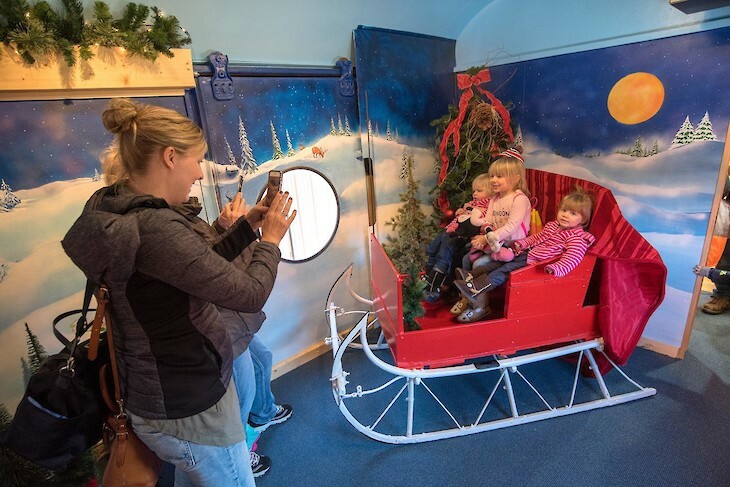 Unlike many Santa experiences, the Santa on the Pizza Train interacts with the kids throughout the event and becomes a friend even before the youngsters sit on his lap to make their Christmas gift requests. 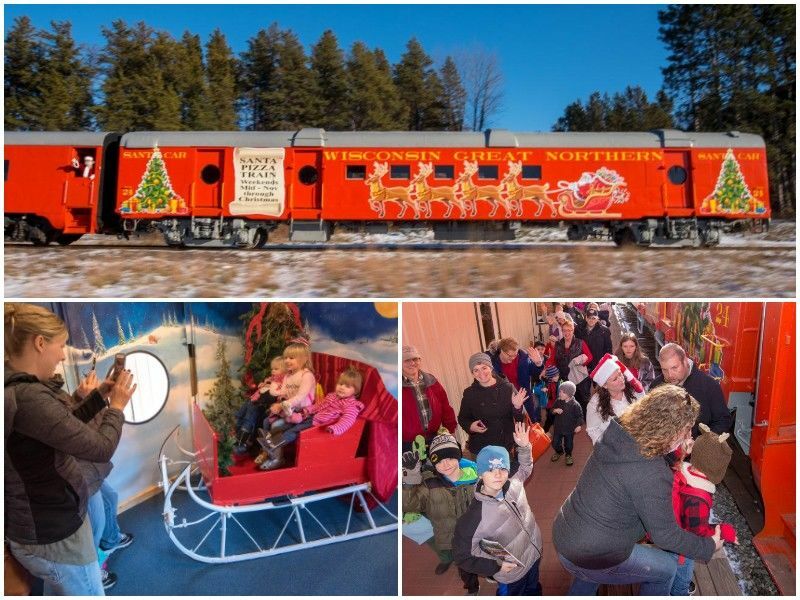 The Wisconsin Great Northern Railroad Santa Car offers guests a variety of background options to create family photos that just might end up on Christmas cards. Local artist, Mary Kay Latzka, painted family friendly vignettes for interior photographs, including a gingerbread house themed mural and a whimsical elf themed North Pole mural. There are many photographic opportunities which are sure to grace Christmas cards in years to come. The trip begins at the railroad's new depot at N6639 Dilly Lake Road, along US Hwy 53/63 about 4 miles north of Spooner, Wisconsin. In addition to the Santa Car, the ride features a streamlined diesel locomotive from the 1940's and rebuilt table cars from the 1930's. The plush dining cars offer guests comfortable seating along with oversize picture windows. 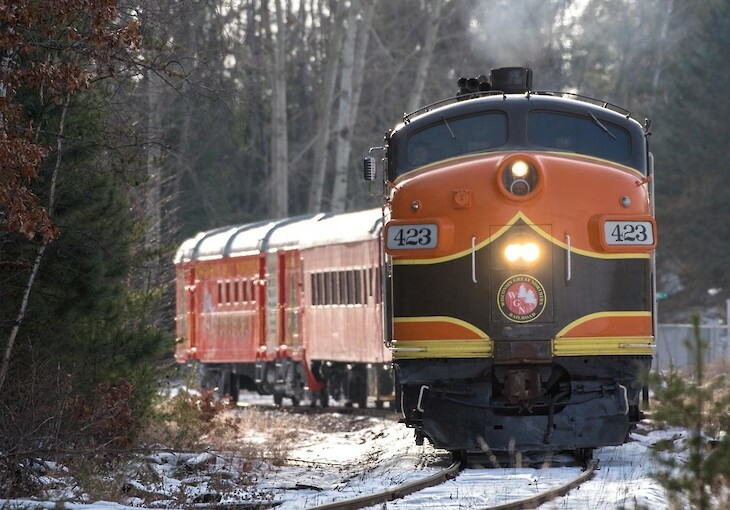 Pizza, drinks, candy canes, cookies, and hot chocolate are served as the train meanders through the northwoods and along the scenic Namekagon River. 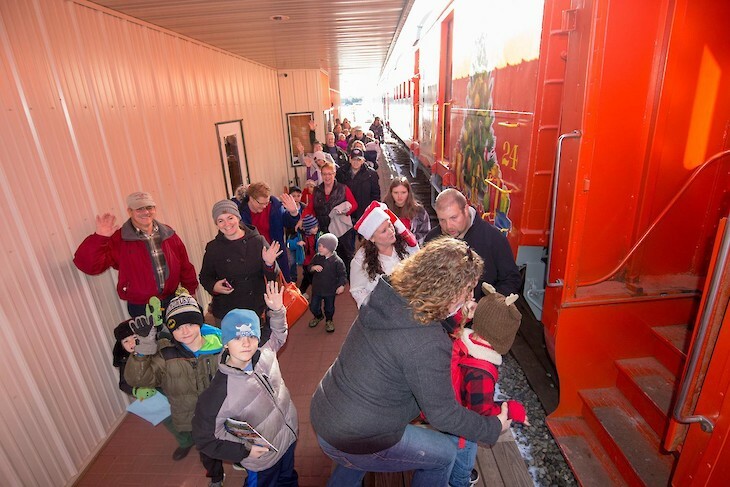 Guests board the popular Santa Pizza Train on the historic Wisconsin Great Northern Railroad at Trego, Wisconsin. The Santa Pizza Train operates each Saturday and Sunday at 11 am and 2 pm through December 23, 2018. Seating is limited and advance reservations are required. Reservations can be made by calling the Wisconsin Great Northern ticket office at 715-635-3200 or online at www.spoonertrainride.com. The railroad also offers America's Only Bed & Breakfast train, elegant dinner train/motel packages complete with a custom shuttle bus, sightseeing excursions, charter lunch trains and many family oriented special events throughout the year. Wisconsin Great Northern Railroad operates 50 weeks a year beginning in early January and ending the Sunday before Christmas. Many trains sell out very early so reservations are a must. The Santa Pizza Train makes its' way through the northwoods near Trego, Wisconsin. Complete schedule information is available online at www.spoonertrainride.com or by calling the railroad office at (715)635-3200.